magicJack costs more in Canada. You can’t pick the last four digits of your Canadian number if you want to. You can’t pick a Canadian “Vanity” number. Chat support may be spottier for Canadians. These are valid enough considerations for most people who live in Canada who think they’re buying a whole package, when in the light of day there are hidden fees not assessed at the time of purchase of the device in a local store. I may actually have some guesses about why some things are the way they are. 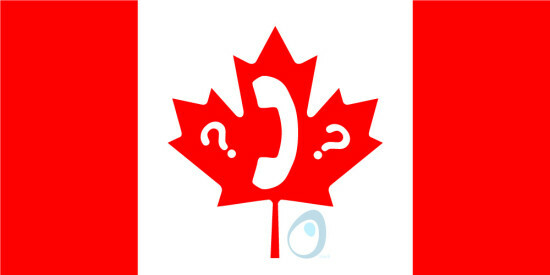 No vanity Canadian numbers – From the point of view of magicJack, since Canadian numbers probably cost more wholesale than US numbers, they’ve probably made it so that all Canadian numbers are considered vanity numbers. Further, if they don’t allow Canadians to choose from among a local list, I’m guessing they only purchase the Canadian number wholesale when you purchase a Canadian number from magicJack. No choice of Exchange – Again, they probably don’t keep a list of phone numbers handy. They may purchase the number wholesale when you purchase it from magicJack. The device costs more in stores. The current exchange for $60 US is $73 Canadian. On Walmart.ca and Bestbuy.ca as if living in Montreal, I see prices set at $70 Canadian. There may be times when it costs more in stores when the exchange rate favors the US dollar more. Spotty Chat Support. This is actually the case in the US some days. When I ask a question, and I have little confidence in my current chat support representative, I’ll close the chat politely and come back in a about five minutes to chat with a different rep. I might do this more than once. So the spottiness may not be specific to Canadian representatives. It may be that the folks in the Philippines who are chat support agents simply are understaffed or staffed mostly with newbies at the time you called. If other Canadians have feedback about this, I and perhaps a few Canadians would be grateful for comments below! Thank you for your video and tips in the thread; they have been very useful. This is a headsup to any and all wanting a Canadian no. especially if you bought/buy your magicJack device in Canada. Even though the Co./MagicJack charges more for units purchased in Canada, and this is even more than the exchange on the Cdn to US $, MagicJack Co. then pressures you into/charges an additional $10.oo US just to get a Canadian no. This is false and misleading advertising because nowhere on the box is it stated that there will be an additional $10.00 US charge for a Canadian no. And now with the exchange rate being so high we are looking at an additional $13.50 to $15.00 Cdn. just to get a Cdn. no. Even when you ask the magicJack chatroom reps. why the Co. wants your credit card no. when you have already purchased the device at a Canadian retail store, the reps. are so poorly trained that they never even think to ask if we are wanting a Cdn no. and did we know that there is an EXTRA US $$ CHARGE over and above the inflated purchase price when purchased from a Cdn retail store. (They think everyone, regardless of where they live, wants a USA phone no.) They never consider the challenges and frustrations that we Canadians are going through in an attempt to get our device registered and thus probably a local Cdn. telephone no. Also, magicJack does not give us the opportunity to choose the ‘exchange’ no’s nor the last 4 digits. They say they have six different ‘exchange’ no’s. available for my area/city, but when you go to pick one they don’t let you. They automatically assign whatever they want to. So my point here is: to all future Canadian customers of magicJack, be prepared to not receive the Customer Service as promised in their advertising and be prepared to pay a lot more than our USA counterpart consumers. Also, don’t be surprised, if in the middle of your conversation with a ‘chatroom’ Support person, that they magically disconnect themselves if the going gets tough. During the ‘crunch times’ of asking questions they did not want to answer or also possibly were so poorly trained that they didn’t know how to help, they just up and disconnect themselves. And when you finally get back into the ‘chatroom’ with a support person, they supposedly have no record of your previous conversation even though you have just given them the previous ticket ID’s. I call this, the ‘escape-goat ‘ routine. Each Rep. is constantly apologizing for the previous one, but none of them ever seem to correct the problem. I have spent over eight hours (yes, 8 hrs) attempting to get this device reg’d and thus an active phone no. and the feat is still not accomplished; mostly due to the fact that the magicJack personnel do not seem to know how to help resolve the problems. Thank you Chris for posting this even though it may seem like I am ranting. My purpose for posting this is to help others wanting a Canadian no. and esp. those who may be considering buying a magicJack device in Canada and also registering a Canadian no. If magicJack takes this as a rant, if they even read it, so be it–they certainly need to improve their product and service. Thank You Chris for all your help! And especiallly knowing that you do this for us while not even being paid by magicJack. I’m Canadian and have been using MagicJack for maybe 5 years; I also pay $10 a year for a local Canadian phone #. I believe that it’s not possible to port over our land line because of CRTC rulings but I could be totally wrong. All I can say is that MagicJack isn’t perfect but I feel that I get more than my money’s worth with my MagicJack. What I pay to MJ a year is what I paid to Bell every month .. go figure. And since I travel internationally is so easy to call back to Canada or the US for Free … also, I use the app on my iPad, cell phone etc. And I do agree that the phone support needs to be improved upon … I’ve spent many hours trying to resolve issues. Most recently although my phone worked many of the features didn’t even though they were programmed properly. So, I was told that I needed to buy a replacement phone; I did. The next day some of the features worked but intermittently and with my new phone they still don’t work. I’m not going to loose sleep over all of this but it is annoying. If someone doesn’t have patience and isn’t willing to troubleshoot, etc. maybe a MJ isn’t for them? Winn, You’ve pretty much summed it up. Glad you’re practical about your expectations. And magicJack will likely never have phone support because it is so darned inexpensive. I’ve had no issues with my MagicJack. Getting a Canadian number was not exactly rocket science either. So it costs me maybe $90CDN in total for a year of telephone that I use & treat exactly the same as a conventional land line. That’s about 1/10th of the cost of using Bell and a long distance plan…..’nuff said! That’s not cool, about the non-portability issue with Canadian numbers. You can upgrade your magicJack. It’s done during the activation of your new device. All the days left on the old device get added to the new device, and your old device becomes a brick. Try setting up two magicJack accounts – one with your Canadian address and one with your US address. You’ll need two different email addresses, obviously. I’ve had my magic jack since 2009 and in 2014 I bought the magicJack PLUS I am very happy with it.I did have to tweak it once in a while with the first one but the chat representative was always very helpful, remember that when chatting with them if you are patient and polite they will be too. I have never had a problem with the chat and if I felt that the person I was talking to didn’t seem to be able to resolve the problem I always asked that my request be escalated and the problem usually got resolved quickly enough. Don’t forget that when they are chatting with you you are not the only one, they usually chat with at least three people at the same time and that was told to me during one of my chat. All that was with my first magicJack but since i’ve had the magicJack PLUS I never had to call them once.You can even take it with you on holidays, in hotel rooms just plug in your magicJack to make free long distance it will work with any telephone. The money we have saved since 2009 is well worth it, no more phone bills, in the last 8 years all we have paid is $250.00 that include the cost of both magicJack and all our long distances including the extra $10.00 a year for my canadian number which in 2009 I was able to choose from a list with no problems I would not go without my magicJack, I live in Canada and my daughter and grandkids live in the USA so yes I do use it a lot and if a call gets drop which does happen sometimes then I just call back, it’s that easy. When I am in the USA family can still call me without charge since it is like they are calling me at home in Canada.